Split testing a Landing Page tests a page's conversion rate. ONTRAPORT automatically splits the number of visitors to the pages equally, and cookies the Contact so that they always see that same page if they come back later. You can create up to 4 different versions of the page. When you see one version is beating out the others, you can stop the split test and send all the traffic to the winning design. In an ONTRAPORT Campaign, the "Visits Landing Page" Trigger or Goal uses the total visits to all the versions. 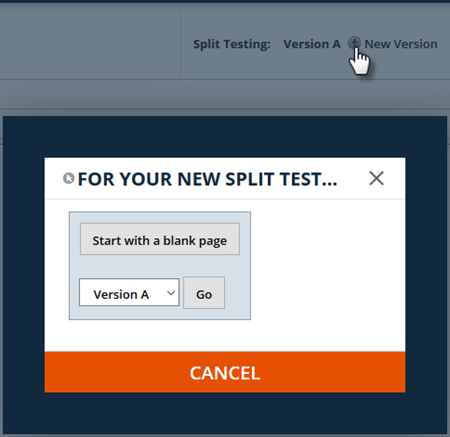 The page you start with is automatically assigned to version A in the split test. You can click the plus sign next to it to add another page. You can select to create a copy of the current page and then edit it, or create an entirely new page. The first additional page you add is automatically page B in the split test. You can add version C and D by repeating steps 2 and 3. ONTRAPORT evenly divides the page visits between each version. To select a version in the editor, select the down arrow next to the version letter and select from the drop down box. 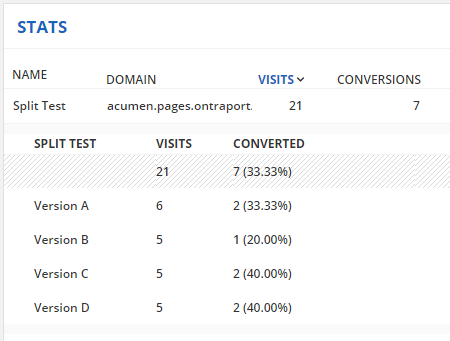 To view the statistics for the split test after the pages have attracted opt ins click the Stats tab. In this example we see that version A has the lowest conversion rate of the four, at 20%. To remove version A from the test, and continue using versions B, C and D, return to the Design tab. Select version A from the drop down and hover over the trash can icon at the top right. It expands to say Remove Split Test. Clicking this link will permanently delete version A from the split test. 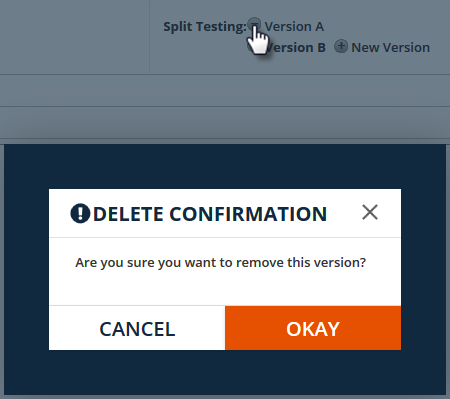 To end the split test, delete all the unwanted versions. Or, slide the Split Test toggle to Off. When the Split Test toggle is set to Off, ONTRAPORT will serve the lowest letter page for all page visits. In this example, where version A has been deleted, ONTRAPORT will serve version B, and version C and D are ignored. Setting the Split Test toggle back to On will result in versions C and D once again being in rotation and served one third of the time. Note: ONTRAPORT cookies the browser with the version it has visited. On return visits, the browser will always see the same version of the page. To test the split test function, delete all cookies between each visit to the page. Click + New Version in the toolbar. 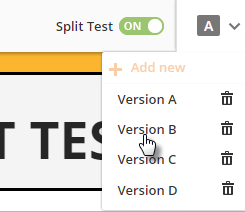 Toggle between the Split Testing Legacy Landing Pages by clicking on Version A or Version B at the upper right of the editing screen. To remove a version from the Split Test, click the minus sign next to the version. ONTRAPORT will continue to serve the pages still in rotation. 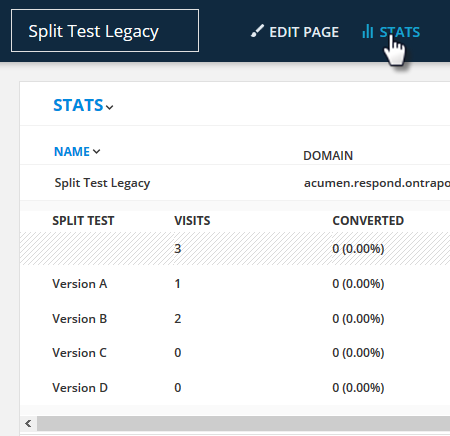 To view the results of your Legacy Landing Page split test click the Stats tab. If needed, click on the name of the page to expand the split test stats. How do you compare the results of the two different versions? @Sohyung Lim, you go into the landing page, and click on 'stats' tab. Then click the name of the landing page and under it a screen expands with the results. Hello ! How can you disable a specific version (I created 4 versions and I can disable the A version but not the others...)? Why can't I find a Stats tab?